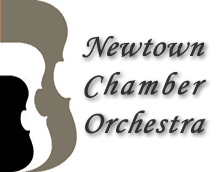 The Newtown Chamber Orchestra continues its tradition of community outreach and education with the annual Young Musicians Competition for high school students. Open to students from Bucks County and surrounding areas, the Young Musicians Competition offers talented high school age musicians an opportunity to audition. The competition winner will be invited to perform as a soloist with the Newtown Chamber Orchestra at a season concert. Some former winners have gone on to have great success in the music field as performers and teachers. How to Apply for the competition.